Blackinton B692 Canadian Badge - B692 - 3 1/8" x 1 3/4"
Home > Blackinton > Police Badges > Canadian Badges > B692 Canadian Badge - B692 - 3 1/8" x 1 3/4"
B692 Canadian Badge - B692 - 3 1/8" x 1 3/4"
Available for our neighboring law enforcement professionals, this Blackinton Canadian badge is style number B693, and it is available in several finishes and fully customizable to fit the needs of your department. Personalize this item with the information of your rank and department on the top, ring, and bottom panels with four lines of text. The badge features a beaver on top. Designed specifically for Canadian agencies, the product line has several styles to choose from. 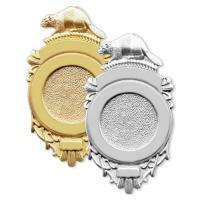 This Canadian style badge measures 2 5/8" x 1 3/4" and is durable enough to last through the toughest situations. Dimensions: 3 1/8" x 1 3/4"
©2002-2019 CopsPlus.com: Blackinton B692 Canadian Badge - B692 - 3 1/8" x 1 3/4"